The movie is never better than the book, is it? It doesn't matter if you're a Goth teen who has every word of Twilight ingrained in your brain or a mom of five who thinks of Eat, Pray, Love as your bible – the film version of any story is usually a poor summary of a good read. Such is the case for Diary of a Wimpy Kid: Rodrick Rules, a movie that actually doesn't hold a candle to the original, seriously awesome books penned and illustrated by Jeff Kinney. Still, it's a fun time at the theater, and even if your own kid leaves a little disappointed with the translation, at least he'll find the themes relatable (annoying older brothers and school crushes, how we haven't missed you). 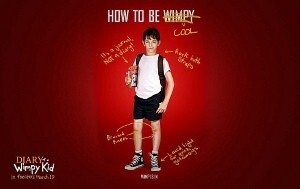 Diary of a Wimpy Kid: Rodrick Rules follows the hero of the series, Gregory "Greg" Heffley (Zachary Gordon), as he enters middle school. Continually bullied by his older bro Roderick (Devon Bostick), the duo's mom soon decides her boys should bond. Can you guess what happens next? Of course, sibling rivalry ensues. Meanwhile, Greg deals with the ruthlessness of adolescence and his sudden interest in classmate Holly Hills. What else is there to say about a subpar film that still does an okay job of tackling the trials of being 12? It's not the best film ever made but it's certainly not the worst. Get your kids out of the house for a few hours, take them to dinner and go home and read them one of the many amazing Diary of a Wimpy Kid books. Congrats – you're suddenly the greatest dad in the world. Child-friendly? Diary of a Wimpy Kid: Rodrick Rules tells the story of Greg, a somewhat wimpy kid who enters junior high school to find it's not all it's cracked up to be. The film contains scenes with some mild rude humor and mischief. Recommended for ages 6 and up.